By placing an order you acknowledge agreement to the following Terms and Conditions, a copy of which is supplied with every order confirmation, or can be downloaded as a PDF by CLICKING HERE. We take your privacy very seriously, and you will find our full policy set out below, including information about Cookies. The website you are ordering from is owned and operated by Bigblue Product Design Limited (Bigblue/we/us/our). As a customer (the customer/you/your) you acknowledge that your purchase is subject to our terms and conditions below. Your statutory rights are unaffected. When you place an order with us, you are making an offer to buy goods. We will send you an e-mail to confirm that we have received your order. Our acceptance of your order brings into existence a contract between us. We must receive payment for the whole of the price of the goods, and acceptance of your order will commence from the time that we send order confirmation invoice by email or by post. The price payable for the goods you order and their delivery is set out in our website. Prices are subject to revision without notice and the prices payable by the customer will be those ruling at the date of order. In the event of a pricing error we will endeavour to contact you with a view to confirming your order at the correct price, changing or cancelling your order. Cancellation of your order at any time prior to commencement of delivery will incur no charge. On commencement of the delivery process (generally 2-3 days prior to the agreed day) any cancellation will be deemed a failed delivery and the supplier’s direct cost of return may be charged, which can be up to 25% of the order value. Although we always endeavour to minimise return fees they do reflect the direct cost to us as applied by our supplier for the return of goods to their premises. In accordance with the regulations, where an item is being made to the customer’s own specification it will NOT be possible to cancel the item, either pre or post-delivery. Customers should therefore ensure that their chosen specification is suitable in all respects prior to ordering. The cancellation period will expire after 14 days from the day on which you or your nominated third party acquires physical possession of the last item on your order. Notification of your decision to cancel this contract must be by email or post to us at the contact details below (use this format), and unwanted items must be restored to our supplier without undue delay and in any event not later than 14 days from the day you communicate your cancellation. Return is at your own cost, which includes the direct recovery costs as charged by the supplier of up to 25% of the order value (down to a minimum of £60 for lower-cost appliances). You will be notified of a collection date within 14 days of the notice of cancellation, and refund will be made as soon as possible within 14 days of return, less any deductions applicable. You have a statutory responsibility to take reasonable care of goods prior to collection. If you fail to take reasonable care of the goods through handling beyond what is necessary to establish their nature, characteristics and functioning, resulting in damage or deterioration, or the products have been installed or used and are unable to be re-sold as new, we will charge you for their diminished value. You should ensure that the goods are packaged adequately to protect against damage, preferably in their original packaging. Should you fail to return the goods or make them available for collection within 14 days we reserve the right to recover the full costs of return. If this extends to 30 days you will be deemed to have accepted the goods and a new purchase order will be issued accordingly. This does not affect your statutory rights. All times or dates indicated for the delivery of the goods are approximate and given in good faith, but are subject to the stock levels at time of processing. Should any delays occur you will be notified promptly by the third party distributor. You will have the option to wait until the stock is available, or to contact ourselves to replace your item with an alternative or cancel your order. Date or time of delivery is not the essence of our contract, and we shall not be liable for any losses or expenses caused by any delay in delivery. Deliveries are made and arranged directly with the customer by a third party manufacturer of distributor. The goods ordered will be delivered to the UK address you give us at the time you make your order. A valid signature is required on delivery, and you will become the owner of the goods on delivery of them to you. The customer is strongly advised to inspect all goods before acceptance and to retain the original packaging for at least 7 days in case return of the item is necessary. We recommend that you do not book fitters to install your goods until you have received and inspected them. Although delivery is usually free of charge to the customer (remote delivery fees may be applied) there are costs associated to the delivery process, and should delivery fail due to customers not being present on the agreed day, or to other customer or site-related reasons (e.g. access problems), then we reserve the right to apply a Failed Delivery charge to cover the cost of further attempts or additional personnel. Opportunities to notify us of any special access requirements are given at point of order, and again when the delivery is arranged, and deliveries are booked on condition that access is reasonable and safe. Any goods that are found to be damaged, faulty or incorrect should be reported immediately and returned where possible on the delivery vehicle. A replacement will be supplied as quickly as possible. Any visible damage should be reported to the delivery team and noted on the delivery document at the time of refusal, and no claims for visible damage will be accepted after the goods are signed for. Do not install or use product that is incorrect or different from that ordered, as this will constitute acceptance of the goods and replacement will not be possible. Your statutory rights are not affected. Goods later found to be damaged or faulty will be subject to an inspection by the manufacturer’s service engineer and will be repaired or replaced as appropriate. The manufacturer provides a minimum of 12 months guarantee for the goods, and details will be supplied with the product. You should be aware that the manufacturers warranty is only valid for goods used within the UK and for domestic purposes only. If you are planning to use the goods for commercial purposes please make sure that you are covered by appropriate insurance. Always install and use your goods in accordance with the manufacturer’s instructions, as failure to do so may invalidate any claim. All goods sold are built and packaged for the UK domestic market only. Where customers may elect to export and use them abroad this is entirely at their own risk. Neither the manufacturer nor we will be liable for issues arising from transit damage or non-compatibility with local requirements. The manufacturer’s warranty will NOT be valid and they will not be liable for any service issues that may arise. All advice offered and information published on our website is given in good faith, but errors may occur or manufacturers may occasionally change their specification without notice to ourselves. Any critical product requirements you have should be checked with the manufacturer to ensure accuracy. Online payment is made via a third party Secure Socket Layer (SSL) Worldpay server, which safely encrypts data in transit. We do not hold payment card details on our website or on any computer. We recommend that you do not send payment details by email or fax, and that you ensure your own technology is secure. We will take all reasonable precautions to keep any personal or payment details secure in accordance with rigorous PCI DSS standards. Unless we are negligent we cannot be held liable for any losses caused as a result of unauthorised access to information provided by you. Additional anti-fraud measures are taken in certain circumstances for the protection of both cardholders and ourselves. With the exceptions of the suppliers involved and our customer reviews partner Trustpilot, we do not sell or share any information with any other third party, and it will be used solely for the purposes of completing our transaction. Goods are supplied to you with appropriate fitting and other instructions relating to their fitting and installation. Certain goods are supplied accompanied by written recommendation that they should only be fitted or installed by expert or skilled workers and it shall be the responsibility of the customer to ensure that they comply with these and where the goods are sold to a third party they are accompanied by all appropriate safety and fitting instructions. We sincerely encourage customers to utilise local collection and recycling facilities (Designated Collection Facilities) to responsibly dispose of their unwanted appliances, and as members of the Distributor Takeback Scheme contribute towards these facilities in lieu of point-of-delivery collection where the manufacturer does not provide this. The contract between us shall be governed by and interpreted in accordance with UK law, and the UK courts shall have exclusive jurisdiction to resolve any disputes between us. Registered in England and Wales 4790224. VAT number 625 4191 49. Should you wish to cancel your contract you must do so in writing within the cancellation period of 14 days from delivery, as set out in our Terms and Conditions. You may use THIS FORM, or compose an email or letter containing the same information. As more fully stated in our Terms and Conditions, and in accordance with the Consumer Contracts Regulations 2014 you will have to bear the direct costs of returning the goods and any refunds will be subject to deductions made for loss of value due to damage or handling other than what is necessary to establish the nature, characteristics and functioning of the goods, plus any other direct cost of return incurred, which may be up to 25% of the value of the items. You have a statutory responsibility to take reasonable care of goods prior to collection, and you should ensure that the goods are packaged adequately to protect against damage. Return must be to an address that we specify (generally the supplier or manufacturer of the goods) and must occur within 14 days of the notice of cancellation. Refunds will be made without undue delay within 14 days of receipt of the returned goods, using the same means of payment as the initial transaction unless otherwise specified, and no fees will be incurred as a result of the reimbursement. As required, we here provide a link to the European Online Dispute Resolution platform, who can also be contacted by email at odr@tsi.org.uk or by phone on 03456 089579. 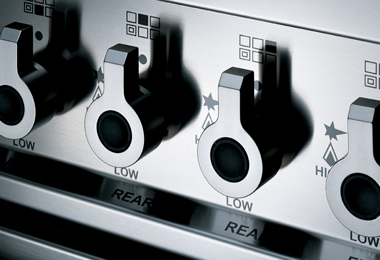 Rangecookers.co.uk is part of Bigblue Product Design Limited, a UK registered company (number 4790224). We fully understand the importance of protecting your personal information. Any details that you volunteer during the course of your order are used solely for the purposes of completing your order, delivering your range products and improving our service. The data controller is Bigblue Product Design Limited. The lawful basis on which we process your data is that of consent. When you place an order, whether online, over the phone or in person, your name, address and contact information will be used solely for the purpose of completing your order. Your payment data is encrypted and sent to our payment gateway partners, Worldpay, if online, or First Data in other cases, to complete the transaction. The order process necessarily includes the sharing of your data with the manufacturer or distributor of your goods (the supplier) who will be delivering the items. We do not store any payment data on any website or database. Other than the supplier we do not share your personal data with any third parties, and it is not used for re-marketing, profiling or any other purpose. We deal only with suppliers employing equally secure policies, and they will not share your data or use it for any other purpose. Access to your order information via our administration system is secured by individual and regularly updated passwords and is limited to our team and, when necessary, our technical consultants. We endeavour not to write down any card data, but where this is necessary it is stored securely according to PCI/DSS guidelines and securely destroyed immediately once processed. We are required by law to hold invoice data for seven years, and this will include some or all of your contact data. At the end of this period any personal data is securely destroyed or deleted, although an anonymous record of the order may be retained. We use Transport Layer Security (TLS) to encrypt and protect email traffic. If your email service does not support TLS, you should be aware that any emails we send or receive may not be protected in transit. We will also monitor any emails sent to us, including file attachments, for viruses or malicious software. Please be aware that you have a responsibility to ensure that any email you send is within the bounds of the law. Our Facebook page is managed by Facebook, who are fully compliant with GDPR rules. Their policy can be found HERE. Should you sign up to our Newsletter mailing list via the specific form, this includes consent that your name and email address are passed to MailChimp, an external service provider, who comply with stringent security and privacy protocols. Every Newsletter includes an opt-out link. Your order data is stored on an external server, with protocols in place to ensure it is secure and alert us to any attempt at data breach. Any paper records made are periodically and certifiably destroyed. You have the right to access the information that we hold about you, and to correct any data that may be inaccurate. You can request that any data we hold is transferred in a mechanically readable form (a CSV file) to another Data Controller. You can also request that any data we hold is deleted. To email us requesting any of the above CLICK HERE. Some anonymous information is retained and used purely for statistical reasons (product data, source of enquiry, etc), and by using the site you give your permission for this. All of the information provided during the process will only be used for the purpose of progressing an application, or to fulfill legal or regulatory requirements if necessary. We will not share any of the information provided during the recruitment process with any third parties for marketing purposes or store any information outside of the European Economic Area. The information provided will be held securely by us and/or our data processors whether the information is in electronic or physical format. We will use the contact details provided to us to contact you to progress your application. We will use the other information you provide to assess your suitability for the role you have applied for, and all details will be securely destroyed once they have served their purpose. We employ two 'first party' cookies which do not share information with any third parties. You can turn off cookie acceptance in your browser if desired, but you will not be able to use our Shopping Basket. The anonymous nature of these cookies means that no “acceptance” button is necessary on entering the website. 1. Google Analytics. Anonymously observes usage of our website for statistical purposes. 2. Shopping Basket. Strictly necessary to complete an order, this will self-delete following completion of the order or browsing session. Securely is always a priority when ordering online, and we ensure our process is a s safe as it can be by using one of the best payment handing companies in the world. Our online payments are handled by Worldpay, one of the major payment processing organisations employing the latest 128 Bit encryption and security systems. Once you have filled out your address details these will be passed safely into Worldpay's secure payment area.Click here for further information. In addition we are a registered member of the IMRG scheme, ISIS (Internet Shopping is Safe), in association with the Trusted Shops scheme. This means that our VAT and Data Protection registrations have been checked for you, and our website and terms & conditions are audited and monitored independently to ensure we trade in a legal, decent, honest, truthful and fair manner. We deal with the product manufacturers on a daily basis, and are happy to recommend that you contact them if you require a further recommendation. You will find their phone numbers on the Brand Information menu. (they may know us by our company name, "Bigblue"). All content, including but not limited to text, photographs and graphics is owned, licensed to or lawfully permitted for use by the site owners, Bigblue Product Design Limited. Other than for normal personal use, the copying, downloading, modifying or storing of any of this material or displaying it for any commercial purposes may not be done without prior written permission of the owners. Any website found attempting to pass off our copyright materials or distinct and established graphical style as their own will be required to remove the pages or materials immediately, and any infringement of our copyright will be pursued to the fullest extent of the law.